ARE YOU A MEDICAL DOCTOR IN THE EARLY STAGE OF YOUR CAREER? Consider an exciting career in the Pharmaceutical industry as a Medical Science Liaison (MSL) and engage with the top clinicians discussing the latest medical/clinical developments using innovative pipeline drugs that can change the lives of millions of patients. 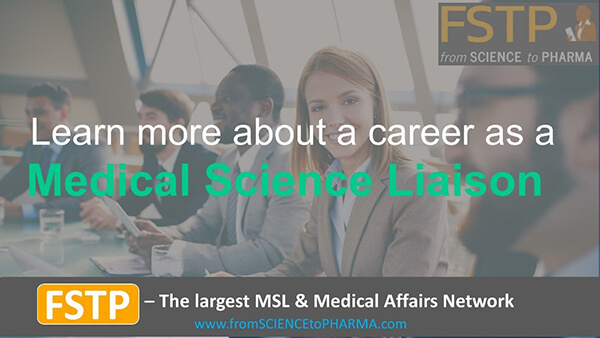 It has never been a better time to start as an MSL, as pharma companies are growing their MSL teams and are in need of medically qualified people like yourself. MEMP’s strategic partner FSTP is the world leading online Medical Science Liaison (MSL) training company. FSTP provides a comprehensive and practical online MSL training platform that helps you to maximize your chances of becoming an MSL. This online training course has been developed by a team of experts who have themselves been MSLs, senior MSLs, (senior) medical managers managing a team of MSLs, involved in coaching and hiring MSLs.